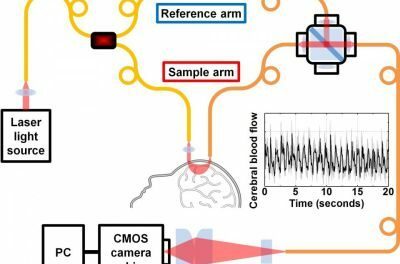 Researchers at the University of California, Davis have developed a spectroscopy technique for measuring blood flow in the human brain, which could be used in patients with stroke or traumatic brain injury. The technique, based on conventional digital camera technology, could be significantly cheaper and more robust than prior methods. The research team improved upon an experimental technique called diffuse correlation spectroscopy (DCS). With the technique, laser light is shined on the head—as photons from the laser pass through the skull and brain, they are scattered by blood and tissue. A detector placed elsewhere on the head, where the photons make their way out again, picks up the light fluctuations because of blood motion. These fluctuations provide information about blood flow. The light signal is very weak, and the further it passes through the skull and brain tissue, the weaker it gets. So DCS requires a number of very sensitive, expensive single photon counting detectors. Boosting the light going in risks burning the patient’s skin. Wenjun Zhou, a postdoctoral researcher working with Vivek Srinivasan, associate professor at the UC Davis Department of Biomedical Engineering, took a different approach, based on the fact that overlapping light waves will reinforce or cancel each other out. They first split the light beam into sample and reference paths. The sample beam goes into the patient’s head and another stronger reference beam is routed so that it reconnects with the sample beam before going to the detector. This boosts the signal, meaning that instead of needing about 20 photon-counting detectors that cost a few thousand dollars each, the researchers could use a single CMOS camera chip for a fraction of the price. They call the method interferometric diffusing wave spectroscopy (iDWS). An added advantage is that they do not need to turn off the room lights while making measurements with iDWS, Zhou says. Eventually, they may even be able to monitor brain blood flow outdoors, under bright sunlight. So far, the team has tested their device by making brain recordings from volunteers in the laboratory. They are working with Dr. Bruce Lyeth and Dr. Lara Zimmermann in the UC Davis Department of Neurological Surgery to validate and adapt the technology for eventual use in neurocritical care. UC Davis has applied for a provisional patent on the technology. Full details of the work appear in the journal Optica.